/ CONTEXT Delsan AIM entered into a contract with the Government of Newfoundland and Labrador (NL) to undertake the decommissioning and demolition of a former paper mill that was located along the eastern shoreline of the Exploits River in the town of Grand Falls – Windsor, NL. The mill operated from about 1909 until 2009 when it was shut down. A hydroelectric generating facility, that was part of the mill operations, remained in-service during the course of the project. / ABATEMENT Delsan AIM managed and executed all aspects of the project, which included the abatement and disposal of all remaining designated substances and hazardous materials, such as asbestos-containing materials, polychlorinated biphenyls, residual oils as well as mercury-containing equipment. 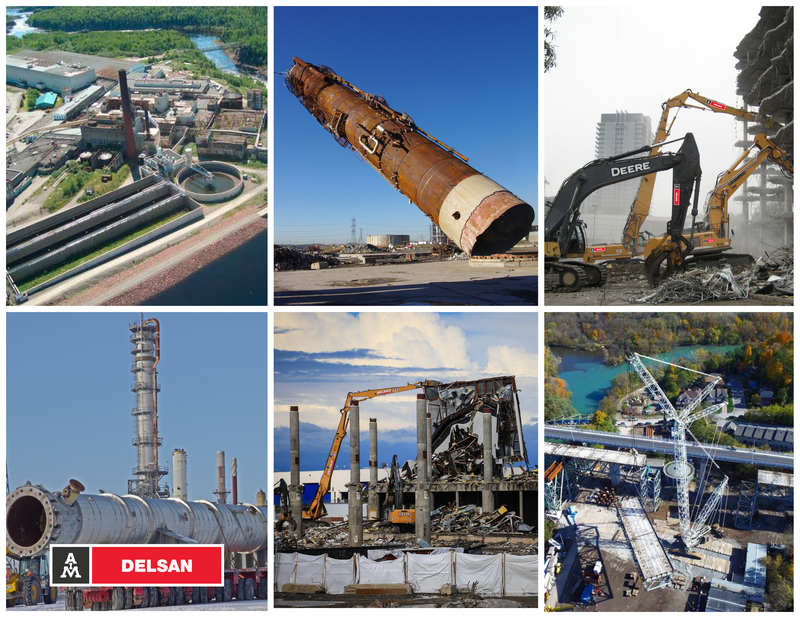 As part of the project, Delsan AIM actively marketed mill equipment through its internet site and completed sales of several items, which included a Fuji King Debarker as well as eight refiners. / DEMOLITION As the decommissioning work was completed, Delsan AIM proceeded with the demolition and removal of the specified buildings and structures by employing mechanical methods using a fleet of eight (8) full-size excavators equipped with a range of specialized attachments for both demolition and material handling operations, such as shears, grapples, buckets, pulverisers, hammers and magnets. / EQUIPMENT FLEET The fleet also included a state-of-the-art high-reach excavator with a maximum range of 80 feet, which facilitated the demolition of most of the higher structures at the site. For structures beyond this range, Delsan AIM employed engineered procedures to safely control drop a 175 feet water tower as well as a 130 feet high precipitator in a carefully planned and executed manner. In addition, Delsan AIM utilized a remote-controlled mini-excavator, suspended by a mobile crane, in order to systematically lower a 220 feet brick stack to a safe elevation, which permitted the remainder of the structure to be demolished with the high-reach excavator. / CONCRETE DISPOSAL & RECYCLING All demolished concrete was reused on site after being crushed to 100 millimetres minus, in order to backfill voids created by the removals and to grade the site to prevent water ponding. Any remaining concrete was stockpiled on site for future use in a designated location as approved by the owner. / SCRAP RECYCLING All non-ferrous scrap metals and shedding material, which amounted to about 5,000 tons, was shipped off site by truck in seacontainers and transferred to the Port of St. John’s for shipment and processing at AIM’s main scrap recycling facility in Montreal. All heavy melt scrap, which totaled about 20,000 tons, was trucked to the Port of Argentia, where it was shipped directly to customers.